This trip affords countless opportunities to contribute to wildlife conservation by visiting famous national parks where some of the world’s most incredible natural attractions can be found. National parks and private reserves protect the world’s last remaining large tracts of natural forest, wildlife refuge and the planet’s biodiversity. Visiting national parks is an important way to contribute to conservation because entrance fees are the core method of funding many parks, from maintenance to security and protection from poaching. Visitors help the parks to pay staff and keep the park protected. We will visit Kruger national park of nearly 2 million hectares, established in 1898 to protect the wildlife of the South African Lowveld (low-lying bush land. ). We visit Kruger National Park not only because it is unrivalled in the diversity of its life forms but also because it is a world leader in advanced environmental management techniques and policies. It is home to over 145 species of mammals, and 507 species of birds, many of which cannot be found elsewhere, meaning without this park, these hundreds of species of animals could be lost forever. In Swaziland we explore the Mlilwane Wildlife Sanctuary, created in the 1950s to conserve the country’s natural heritage. We will also visit the Umfolozi Game Reserve and the St. Lucia Marine Reserve, which is home to complex body of vleis (wetlands), pans, swamp forests and grasslands. These include the lake itself, a wilderness area known as Mfabeni and Tewati, a marine conservation area, the reed and papyrus wetland of the Mkuze swamps and western shores, and a fossil shoreline more than 25,000 years old.This was the first game reserve in South Africa. Today the Greater St. Lucia Wetland Park stands as a beacon to the efforts for conservation in South Africa. 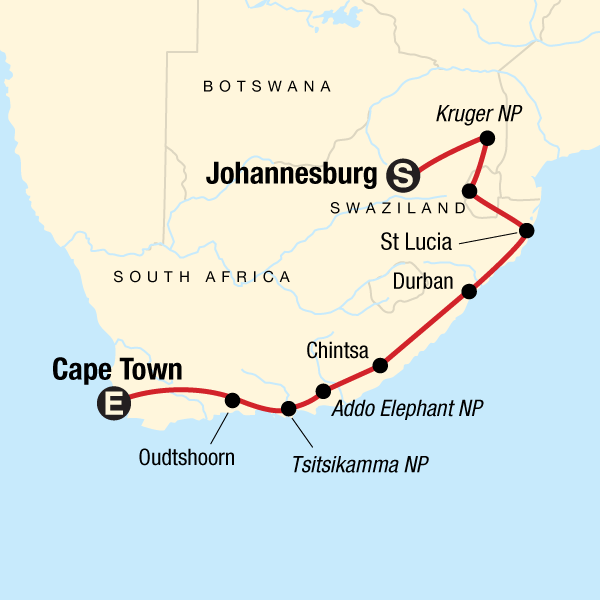 It doesn’t stop there; we also visit Addo Elephant National Park, Tsitsikamma National Park which covers 68 kilometres of South Africa’s most spectacular marine resources, the Cango Caves, Cougar Outreach Program, and more. This trip gives you the chance to show your support for these efforts in conservation that are essential for preserving the planet’s natural heritage long into the future. Low Impact Accommodation: The accommodation used on a trip can make the difference between local people receiving many benefits or none at all. It can also mean huge impacts or minimal impacts on the environment. On this trip we camp, at designated campsites in national parks and outside towns, and we also stay in thatched huts, bungalows, and small hotels. Camping is a very low-impact style of accommodation because the structures are temporary! Camping means little to no electricity consumption, low water consumption and definitely no energy sucking air conditioning! Camping in Africa is truly an adventure. You will be able to get off the beaten track to get a first-hand experience of the beautiful wilderness and nature. Just remember we will be taking everything with us that we brought to the area, and using reusable items so as to create little to no waste. In Inhambane, Maputo, and Durban, we stay in backpackers’ (hostels) or small guesthouses. Explore Cape Town with locals – Cape Town is the oldest city in South Africa and rich with a diversity of culture and history. Take a trip over to Robben Island, join an organised tour to one of the shanty towns. Or have a true Cape experience on a tour through the 'Bo Kaap' and the old District Six. The people from this area have developed independently from other regions in the country and have a rich slave/Malay background from years back. Visit a local village - Visit the nearby Khoisan Village, come meet the people, listen to their stories and learn about their culture and enjoy a traditional meal cooked on open fires. Soweto – Soweto, neighboring Johannesberg, is the home of many great South Africans. You will find the house of former President Nelson Mandela and Nobel Peace Price winner Desmond Tutu's house in one street. Visit the shanty town part of Soweto where people struggle on a daily basis to make ends meet. This is still a raw suburban life that did not change much in their way of life over the past years. After your tour go sit in a local bar 'shebeen ' for a sip of traditional mquombothi or ingudu. Visit our Community Projects: On many of our trips we offer the opportunity to visit one of the local projects we support through our non-profit foundation. Travellers can donate to any one of our projects through our “dollar-a-day” program, or at the end of a trip, but also have the chance to take part in the activities with our partners while in the area! On this trip we will be nearby two of our projects, Red Hill and Shelati Pre-schools, where you can visit the children or volunteer for the day, and see the difference these schools are making in their communities. Red Hill Primary School: The Red Hill Pre-School is located amongst the informal settlement of Red Hill Township, outside Cape Town, South Africa. The Pre-School is made up of over 30 children between the ages of 2 and 6. This settlement has been slowly expanding over the last 20 years to house displaced Africans and refugees living in poverty. Approximately 2,500 people live in this area, in houses made from scrap materials such as iron and wood. Many are unemployed, and are unable to provide their children with food or opportunities to receive an education. The Red Hill Pre-School was closed in 2007, and then re-opened in 2008 through a partnership with the Happy Africa Foundation which we support with the help of our travelers. Shelati Pre-school: The Shalati Pre-School is located in the Mnisi community, near Kruger National Park and the Manyeleti Game Reserve. Over 50 children, under the age of 8, attend the pre-school. In the South African community of Shalati there are many single parent families and a vast number of orphaned children, often cared for by their grandparents. This is due in part to the prevalence of HIV/AIDS. Many children do not begin school until the age of eight, and receive no formal education and limited support during their early formative years. The Shalati Pre-School aims to provide children with the opportunity to begin their education, and become involved in organized activities. On this trip you have the opportunity to help out at the schools. This company has operated on responsible tourism values since its inception. From an environmental perspective, our initiatives extend from our company offices to our tours. A local green energy provider powers our head office and stores; we encourage cleaner transportation methods for staff; and purchase all supplies from a local green business supplier. Our office is as paperless as possible and our brochures use 100% PEFC certified sustainable paper. We offset emissions from all corporate flights and our marine vessel, and encourage our travelers to do so by providing an online platform through Sustainable Travel International. Supporting communties is and always has been at the heart of our tours. We provide business opportunities to local people by employing local guides and tour operators. The majority of accommodation used on our tours are small-scale, locally-owned hotels. Our tours mainly use public transportation wherever possible and are small in size to keep our impact on fragile sites and communities as minimal as possible. We monitor the sustainability of our tours through traveller evaluations in order to allow for continuous improvement. We support the local economy and business initiatives by visiting locally-owned shops, restaurants, and markets on our tours. Many tours incorporate community projects as a way of supplementing community income and supporting community development projects. In 2003 we founded a non-profit organization as a way for our travellers and our company to give back to the people and places we visit. We develop community projects around the world in the areas of health, education, small business development and environmental conservation. Funds are raised through traveller donations and fundraising. The company pays all administration fees which means that 100% of each individual donation goes directly to the community projects. Each year, we continue to support and develop new partnerships with more community projects and community-based tourism initiatives worldwide, in Latin America, Asia and Africa. On most tours, including this one, you have the option to visit a project as part of your trip. Tour leaders provide travellers with information about local environmental issues in their respective regions, and provide suggestions of how we can best protect the local environment and culture. To reduce the amount of waste created on tours, tour leaders also encourage travellers to use refillable water bottles instead of disposable plastic, cotton tote bags, reusable batteries, etc. We also include destination-specific information in our guidebooks, which are provided to each traveller including information particular to the local culture and environment and tips on how to be a responsible traveller.